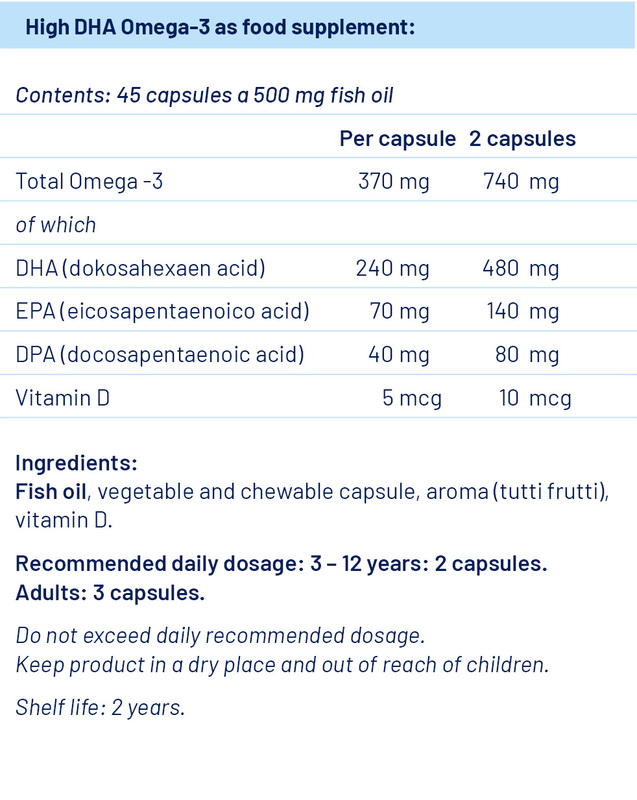 Omega-3 for kids in vegetable and chewable capsules. Omega-3 fatty acids are polyunsaturated fatty acids that are essential nutrients for health, and since our bodies cannot make Omega-3 fats, we must get them through food or supplements. Omega-3 is the worlds most tested food supplement. What does Omega-3 do, and why do health authorities worldwide recommend daily consumption for both kids and adults? - Polyunsaturated acids are necessary for the optimal function of every cell in our body. Their primary purpose is to maintain membrane flexibility for every cell so that all cell receptors can receive and transmit messages. - Omega-3 consists of DHA and EPA. Our body needs DHA for brain development and maintenance, and is beneficial for eyes and heart. EPA reduces inflammation and is beneficial to the heart. - Several studies prove that children with concentration and learning difficulties often have lower Omega-3 levels in their body. Intake of an Omega-3 supplement may therefore have a positive influence on children’s concentration, learning and other cognitive functions. Why chewable capsules from Bjørge Ocean?